If your idea of a perfect celebration involves the sound of a cork popping, a trip to Sonoma County, California, should be on your bucket list. Sonoma is an ideal grape growing region for California “champagne” and produces delicious sparkling wines in red, white, and rosé. 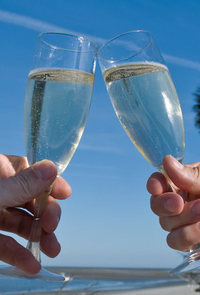 To taste some of the region’s best bubbly, sign up for a Sonoma champagne tour. Sonoma Wine Tours offers a variety of private wine tours as well as a fabulous champagne tour through Sonoma County’s hidden cellars. Guests can enjoy a 4-5 hour journey through J Vineyards, Iron Horse, Korbel, and Roderer and sip some great bubbly along the way. Sonoma Wine Tours will customize your tour to fit your specific preferences and tastes. Korbel Champagne Cellars: Korbel is well known for their sparkling wine. Visitors can take a free 50-minute tour through the historic champagne cellars in Sonoma County and then enjoy a tasting of Korbel’s finest products. The winery offers private guided tours by appointment. Gloria Ferrer Caves & Vineyards: Gloria Ferrer is a Spanish-style winery that produces sparkling Pinot Noir and Chardonnay. It was the first sparkling wine house in the Sonoma Carneros AVA and now has over 335 acres of vineyards. The winery offers public, private, and group tours of their caves and sparkling wine facility. After the tour, order a glass or flight of sparkling wine to enjoy by the fire or on the veranda. J Vineyards: This winery is located in the Russian River Valley AVA and was named the “Best Winery Tasting Room in the West” by Sunset Magazine. Guests can enjoy a one-hour vineyard tour followed by a tasting of sparkling and varietal wines. You’ll visit the fermentation room, barrel room, bottling areas, and the Crush Pad where grapes are pressed. Tours are $30 per person and begin at 11:30 a.m. and 2:30 p.m. daily. Iron Horse Vineyards: Iron Horse is a beautiful family-owned winery that’s situated on a hilltop in Sebastopol, CA. The sparkling wines produced here have been served at the White House for over 30 years. Stop by the outdoor tasting room to try five estate wines against a stunning backdrop of Sonoma and Mt. St. Helena. Or, sign up for the VIP tour and tasting for a behind-the-scenes look at the sparkling wine production process. 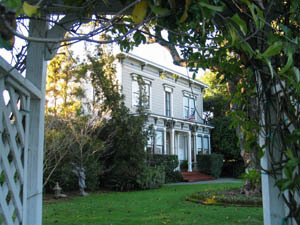 While visiting Sonoma wine country, stay at Honor Mansion, a luxurious Healdsburg bed and breakfast. Following your wine tour enjoy late afternoon refreshments sampling an assortment of delicious local wines and scrumptious hors d’oeuvres each day. In the morning, you’ll wake up to a delicious gourmet breakfast—and be ready to take on California Wine Country all over again.